Theresa May, Mims Davies, Amy and Kevin Winchcombe. 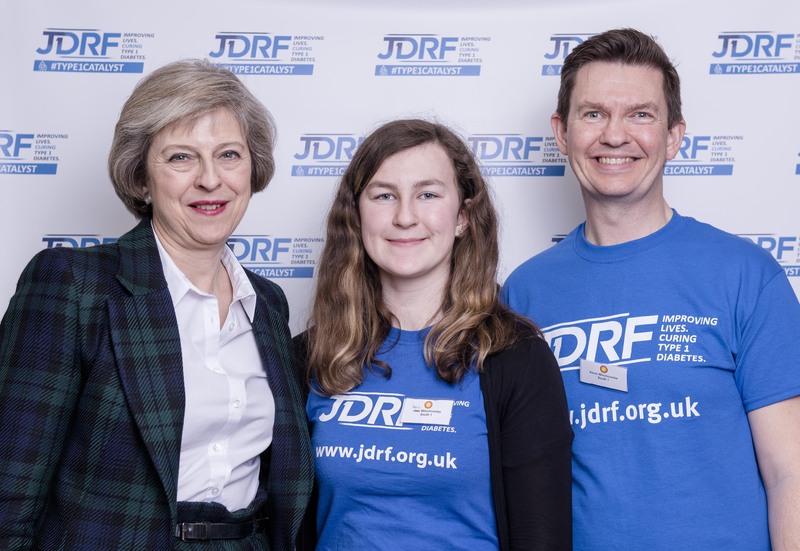 It was a surprise when I opened the email inviting Amy and me to attend a Parliamentary reception, hosted by Jamie Reed MP and JDRF. What an opportunity not to be turned down, a chance to educate some MPs in the ways of Type 1 life. Amy and I decided to make a day of it as going to London isn’t a regular occurrence for us. Arriving at Kew we headed straight for the one and only place on both of our minds, Camden. We both love it there, Amy especially and I made sure I kept my credit card firmly in my pocket, nowhere near Amy’s eyes and all those clothes, boots and all things funky. On the downside Suggs was nowhere to be seen. Off to Parliament and nervously I waited in the security line wondering how they would react to Amy’s xDrip device, surely they wouldn’t be bothered about a collection of electronic components, with dodgy soldering, wires everywhere? Surely not…hmmm…well maybe. Turns out they weren’t bothered at all and didn’t even ask Amy to explain what it was. Parliament started with a set change for Amy, then a hypo which took ages to clear and with the thought of standing up for two hours I kind of regretted the 3 or so hours spent wandering around Camden’s maze. Our MP, Mims Davies, was keen to attend the event, accepting my invite immediately, and it was great to see her again and chat about Amy’s life with Type 1 and some of the research being done. Mims picked up a copy of JDRF’s Type 1 Research Today report published that day, something I’d not had a chance to read yet. Mims is always keen to learn more about Type 1 and Type 2 and that’s something we’re grateful for. Afterwards Mims published a campaign article More Research Needed for Type 1 Diabetes. We went to get a professional photo done with Mims and the Home Secretary Theresa May was there so we got the chance to meet her. She was lovely with Amy, discussing favourite hypo treatments and how she prefers Jelly Babies to Dextro, which is Amy’s preference. Jamie Reed opened the talks with a great line saying we are the people we have been waiting for and how we can make the difference. Nodding in agreement I felt like shouting WeAreNotWaiting but the introvert on my shoulder got the better of me, thank God. Further talks about research which ended with Karen Addington, JDRF’s Chief Executive, who was a pleasure to listen to and brought a lump to my throat when she proudly held a ViaCyte’s stem cell ‘sack’ which is a very exciting development. I was very honoured to be introduced by INPUT’s Lesley to Professor Jonathan Valabhji (ational Clinical Director for Obesity and Diabetes at NHS England) and as you can imagine I wasted no time in discussing Nightscout, xDrip and the whole DIY movement. He was very interested so I offered him the chance to learn more with a proper demo which I hope he’ll take me up on. I may not like public speaking but there’s something about Nightscout which overrules all that. The day itself was made so much better given the number of people I knew there, Ellie, Lydia, Helen, Jeff, Lesley and so many more. Meeting Carl for the first time was great and I can’t wait until our team of dozens of Diabetes Dads cycle around London overnight in the Nightrider, it little over 4 weeks. It was lovely to meet JDRF’s Karen, Sarah and Kris again and Sarah did a brilliant job of organising it. I felt we needed several hours just to chat, but isn’t that the way in these Diabetes community meet ups. The technology is great but the people are just fab. Tagged events, JDRF, parliament, research. Bookmark the permalink.